Objective: To investigate whether infliximab can be used in combination with cyclosporin A (CsA) in patients with refractory rheumatoid arthritis (RA) who cannot tolerate methotrexate (MTX). Materials and methods: Eighteen patients with refractory RA receiving low dose CsA (2 mg/kg/day) and prednisone (5 mg/day) were treated with intravenous infliximab. The patients were given infliximab (3 mg/kg weight) at 0, two, six, and every eight weeks thereafter for a total period of 12 months. Clinical improvement was evaluated according to the American College of Rheumatology (ACR) 20% response criteria. 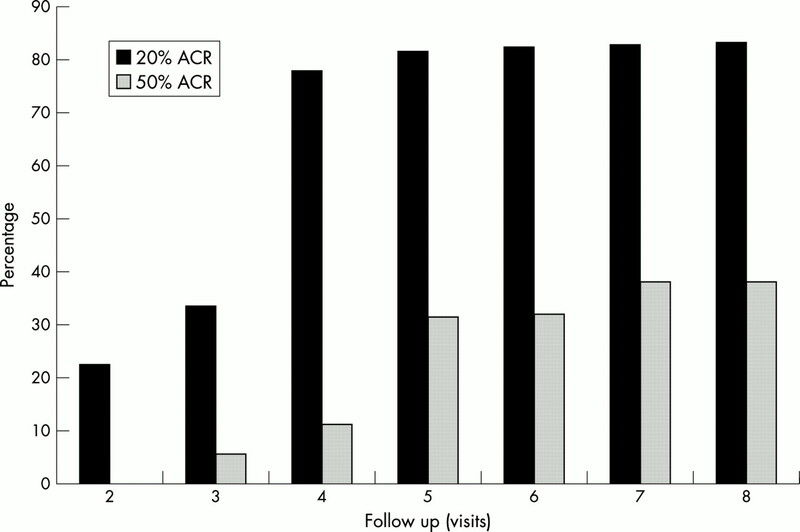 Results: Eighty per cent of patients receiving the combination treatment with CsA and infliximab achieved the 20% ACR criteria for response to treatment, whereas 39% satisfied the 50% response criteria. In addition, a 76% reduction in swollen and tender joint count was found. Finally, a reduction in C reactive protein and erythrocyte sedimentation rate was maintained throughout the study. In general, treatment was well tolerated, with minimal adverse drug reactions. Two patients dropped out; one because of an immediate hypersensitivity reaction and the other because of the development of pulmonary tuberculosis. Conclusion: Multiple infusions of infliximab and low doses of CsA improve patients with refractory RA. It seems that CsA may be an alternative disease modifying drug to be used in combination with infliximab in patients with refractory RA who cannot tolerate MTX. To investigate the efficacy, tolerability, and safety of infliximab in combination with CsA, we conducted a 12 month pilot study in patients with severe refractory RA. Eighteen patients who fulfilled the American College of Rheumatology (ACR) criteria for RA11 were studied. The patients had had active disease for at least three months, were refractory to many DMARDs, and had discontinued MTX treatment because of various side effects. The current treatment was CsA and prednisone and despite this, the patients had active disease. We therefore investigated whether infliximab would provide additional clinical benefit to patients who had active RA. The patients were given intravenous infliximab (3 mg/kg) at 0, two, six, and every eight weeks thereafter for a total period of 12 months. At the time of the start of treatment the dose of CsA for each patient was 2 mg/kg, the dose of prednisone 5 mg/day, and these remained stable during the study. The mean time of CsA treatment was 16.1 (SD 8.3) months, ranging from six to 41 months. During this treatment period CsA was well tolerated without serious adverse drug reactions. Patients were excluded from the study if they had (a) a history or presence of malignant diseases, (b) known liver or kidney abnormalities or history of viral hepatitis B and C, (c) major complicating diseases such as amyloidosis or heart or lung disease, (d) a positive tuberculin skin test using PPD/RT23 (2 IU/0.1 ml or abnormal chest radiograph suggesting chronic infectious disease, granulomatous disease, or other pathological findings. Each patient underwent a complete physical examination before treatment and at each visit until the end of the study and every two months thereafter. Clinical disease variables included (a) duration of morning stiffness (minutes), (b) grip strength (mm Hg), (c) total joint count with tenderness or swelling, (d) number of swollen joints, (e) number of tender joints, (f) pain score (VAS; cm). Laboratory disease variables included C reactive protein (CRP; mg/l) and erythrocyte sedimentation rate (ESR; mm/1sth) that were performed at each patient's visit, which corresponded to infliximab infusion at weeks 0, two, six, and every eight weeks thereafter. A joint was defined as active if patients had synovitis with pain, swelling, and tenderness on pressure. 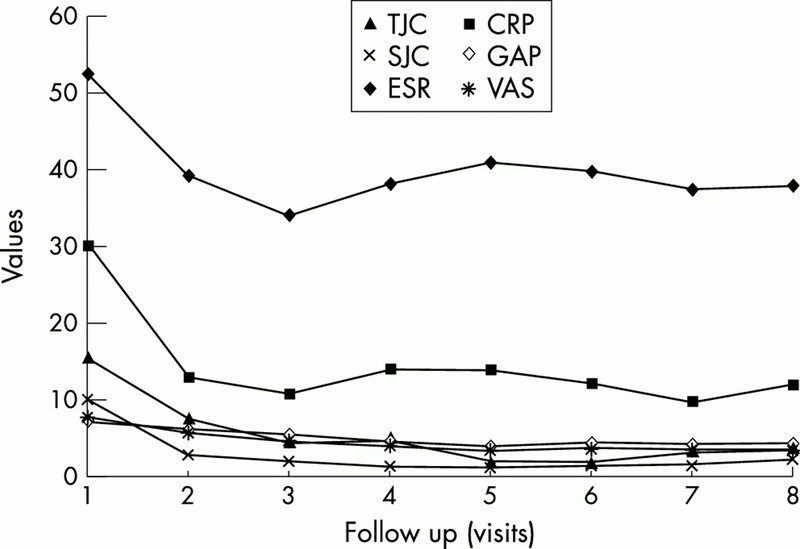 Disease was defined as active if patients had six or more active joints, high CRP (≥10 mg/l), and high ESR (≥40 mm/1sth). A complete blood count with differential and platelet count, as well as serum values of liver enzymes, bilirubin, albumin, glucose, and creatinine, and urinary analysis were obtained before treatment and at each patient's visit, until the end of the study and every two months thereafter. Finally, 2 ml blood serum from patients (at each visit) were stored at –20°C for the measurement of autoantibody profile. Response to combination treatment with infliximab and cyclosporin A. A reduction of 76% of swollen and tender joints was found, which was associated with a reduction in CRP and ESR of 71.5% and 38% respectively. Improvement of pain score and GAP were also noticed. TJC, tender joint count; SJC, swollen joint count; GAP, global assessment by a physician; ESR, erythrocyte sedimentation rate; CRP, C reactive protein, VAS, pain score. American College of Rheumatology criteria for response to treatment. Eighty per cent of patients receiving the combination treatment of infliximab and cyclosporin A achieved the 20% response criteria, and 39% of patients satisfied the 50% response criteria. Infliximab was well tolerated, with minimal adverse drug reactions. One patient developed acute aching, pain, and tingling affecting the legs, which occurred six hours after the fifth infusion. This side effect responded very well after 12 hours of treatment with diclofenac. Two more patients developed an upper respiratory tract infection after the fifth and sixth infusion respectively. Both responded very well to oral erythromycin and antihistamines. In addition, two patients discontinued treatment. One stopped receiving infliximab after the fifth infusion owing to an immediate hypersensitivity reaction, which was manifested by redness of the face, dry cough, and mild dyspnoea. This patient responded well to intramuscular injections of antihistamines and hydrocortisone. The second patient was withdrawn from the study because of the development of pulmonary tuberculosis after the sixth infusion, despite the fact that she had a negative PPD skin test and normal chest radiograph. None of our patients developed hypertension requiring treatment and none had serum creatinine concentrations increased 30% above the baseline measurement. Finally, none developed clinical features or laboratory abnormalities suggesting systemic lupus erythematosus or other autoimmune diseases. Studies have shown that infliximab is effective and safe in combination with MTX in patients with refractory RA.8,9 However, not all patients tolerate MTX and there have been no reports using infliximab with other DMARDs in patients with RA. On the other hand, a recent study by Maini et al has shown that combined treatment with low dose CsA and anti-TNFα treatment caused a significant reduction in severity of disease in collagen induced arthritis, suggesting that CsA could be given in combination with anti-TNFα.14 Thus the present study was designed to investigate the efficacy, tolerability, and safety of infliximab treatment in combination with CsA in patients with refractory RA who cannot tolerate MTX. We have treated severe, long standing mostly seropositive patients with RA. Eighty per cent of our patients had a clinical response according to the ACR 20% criteria,12 whereas 39% achieved the ACR 50% criteria.13 The degree of improvement is particularly noteworthy in view of the inclusion of patients resistant to at least four DMARDs and with aggressive disease. Infusions of infliximab were generally well tolerated. One patient developed pain and aching involving the legs and two developed infections in the upper respiratory tract. Two patients dropped out, one because of an immediate hypersensitivity reaction and another because of the development of chest tuberculosis, which probably represents a de novo tuberculosis infection, as our patients had a negative PPD test and normal chest radiograph before the start of of infliximab treatment. The absence of serious side effects with CsA is probably attributed to the low dose of CsA used and to the fact that none of our patients received non-steroidal anti-inflammatory drugs, which may increase blood pressure and interfere with renal function.10 These results are comparable with those reported in the studies of Maini et al and Lipsky et al in which they used infliximab in combination with MTX.8,9,15 It seems that infliximab can be used safely with CsA. The combination of infliximab and CsA provides a strategy for future trials in RA to investigate whether anti-TNF treatment offers substantial progress in retarding the destructive disease process and improving the patients' quality of life. Another factor to take into consideration is the development of antibodies against infliximab. Such antibodies developed in patients after repeated treatment with the drug. The incidence of this however, was reduced by concomitant treatment with MTX.8,9 In the present study we do not yet know if the use of infliximab together with CsA may reduce the development of such antibodies. Serum samples from two patients who stopped receiving infliximab are now under investigation at the central laboratory of Schering Plough Pharmaceuticals in the United States. This pilot study provides evidence that CsA may be an alternative DMARD, to be used in combination with infliximab in patients with refractory RA. However, double blind comparative studies with a large number of patients are needed to demonstrate the efficacy and safety of infliximab in combination with CsA. We thank Mrs Eleni Horti for her secretarial assistance. Feldmann M, Brennan FM, Maini RN. Rheumatoid arthritis. Cell1996;85:307–10. Choy EHS, Panayi GS. Cytokine pathways and joint inflammation in rheumatoid arthritis. N Engl J Med2001;344:907–16. Koch AE, Kunkel SL, Strieter RM. Cytokines in rheumatoid arthritis. J Invest Med1995;43:28–38. Bazzoni F, Bentler B. The tumor necrosis factor ligand and receptor family. N Engl J Med1996;334:1717–25. Wolfe F, Hawley DJ, Cathey MA. Termination of slow acting anti–rheumatic therapy in rheumatoid arthritis: a 14–year prospective evaluation of 1047 consecutive starts. J Rheumatol1990;17: 994–1002. Tugwell P, Pincus T, Yocum D. Combination treatment of severe rheumatoid arthritis with cyclosporine and methotrexate in severe rheumatoid arthritis. N Engl J Med1995;333:137–41. O'Dell JR, Haire CE, Erikson N, Drymalski W, Palmer W, Eckhoff PJ, et al. Treatment of rheumatoid arthritis with methotrexate alone, sulfasalazine and hychoxychloroquine or a combination of all three medications. N Engl J Med1996;334:1287–91. Maini RN, Breedveld FC, Kalden JR, Smolen JS, Davis D, Macfarlane JD, et al. Therapeutic efficacy of multiple intravenous infusions of anti–tumor necrosis factor a monoclonal antibody combined with low–dose weekly methotrexate in rheumatoid arthritis. Arthritis Rheum1998;41: 1552–63. Maini R, St Clair EW, Breedveld F, Furst D, Kalden J, Weisman M, et al. Infliximab (climatic anti–tumor necrosis factor alpha monoclonal antibody) versus placebo in rheumatoid arthritis patients receiving concomitant methotrexate: a randomized phase II trial. ATTRACT Study group. Lancet1999;354:1932–9. Papadopoulos NG, Alamanos Y, Papadopoulos IA, Tsifetaki N, Voulgari PV, Drosos AA. Disease modifying anti–rheumatic drugs in early rheumatoid arthritis: a long–term observational study. J Rheumatol2002;29:261–6. Felson DT, Anderson JJ, Boers A, Bombardier C, Furst D, Goldsmith C, et al. American College of Rheumatology preliminary definition of improvement in rheumatoid arthritis. Arthritis Rheum1995;38:727–35. Felson DT, Anderson JJ, Lange MLM, Wells G, LaValley MP. Should improvement in rheumatoid arthritis clinical trials be defined as fifty percent or seventy percent improvement in core set measures, rather than twenty percent? Arthritis Rheum1998;41:1564–70. Williams RO, Mauri C, Mason LJ, Marinova–Mutafchieva L, Ross SE, Felmann M, Maini RN. Therapeutic actions of cyclosporine and anti–tumor necrosis factor α in collagen–induced arthritis and the effect of combination therapy. Arthritis Rheum1998;41:1806–12. Lipsky PE, van der Heijde DMFM, St Clair EW, Furst DE, Breedveld FC, Kalden JR, et al. Infliximab and methotrexate in the treatment of rheumatoid arthritis. N Engl J Med2000;343:1594–602.